Zeus Link Wi-Fi 3G is a kit that allows you to extend the connection of any device with an Ethernet or Fast Ethernet interfaces, or any network to Ethernet standards with Internet access in 3G mode. 3G kit uses an external 3G dongle to be connected to the USB interface, used to give Internet access to the device / network to which it is connected. In the latter case, Zeus Link Wi-Fi will have the functionality of a Router for Internet access. The built-in Wi-Fi antenna allows you to not have problems on the front of the device, while the USB 2.0 cable Male 90 ° - Female 0° provided allows you to install the USB dongle in a comfortable place with respect to the device and simultaneously to limit depth required to allow the closure of the electrical panel door. 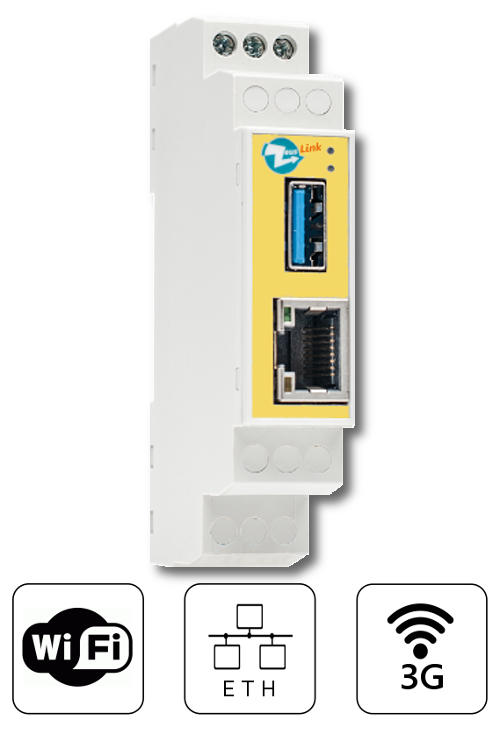 It 'also provided a network patch, useful for connecting Zeus Link and Zeus Din, also designed to limit the depth required in order to allow the closure of the electrical panel door that houses it.